Montsoreau is a lovely little village on the banks of the Loire river in between Saumur and Tours. It is a classified "most beautiful village of France" and was also nominated in the 2012 edition of the 'preferred village of the French' (village préféré des Français) competition organised by the France 2 television channel. Candes-Saint-Martin is a beautiful village in the Indre-et-Loire department and sits on the confluence between the River Loire and the River Vienne. It is about half way between Saumur and Chinon. Candes-Saint-Martin was nominated for the preferred village of the French in 2016 in a competition held by the France 2 television channel. You will probably visit Azay-le-Rideau in order to visit its dramatic castle but whilst you are here take the time to visit the pretty town that has built up around the castle. Azay-le-Rideau is situated in the Loire Valley between Saumur to the west and Tours to the east. Langeais is best known for its imposing 15th century castle which is in the centre of town in the heart of the main shopping streets. The Chateau de Langeais has many furnished rooms and important tapestries and in its extensive grounds there are gardens and the remains of an older castle which is actually the oldest castle in France. To help you plan your visit select a guide from the list of towns and villages shown below. Nevers is just outside the eastern border of the Loire (centre) region in the Nievre department of Burgundy. Although it is therefore not really in the 'Loire Valley' it is included here because (a) it is at least on the banks of the River Loire! (b) if you are visiting the eastern Loire it would make for an interesting excursion. Today the city is famous for its ceramics and it is also one of the major pilgrimage centres of France because the city has kept the body of Bernadette Soubirous (1844-1879) - after seeing apparitions of the Virgin Mary in 1858 bernadette lived and worked as a nurse in the convent of the Sisters of Charity. The village of Saint-Benoit-sur-Loire - and the abbey that attracts the visitors here - are found to the south west of Orleans in the Loiret department - hence a reasonable distance to the east of most of the 'attractions' of the Loire Valley. Gien is situated to the east of Sully-sur-Loire and south-east of Orleans, so is pretty much on the 'eastern frontier' of the 'Loire Valley' as it is usually considered. The town is on the banks of the Loire, which is crossed here by a long arched bridge. The town is best known for two things - some very famous pottery (faience) is produced in Gien, France; and also for the castle of Gien which is in the centre of the town. Bourges is located towards the south east of the Loire Valley region and south from Orleans. The town is best known for its cathedral, although the town itself has other attractions as well, especially an abundance of buildings constructed in the years after the 'Great fire of Bourges' in 1487. Chartres is located towards the east of the Loire Valley region and south-west of Orleans. The town is very famous because of its cathedral, and is also a substantial town with other attractions and highlights for the visitor to discover. There is more to the Loire Valley than castles and cathedrals and scattered across the countryside of the region there are many small towns and villages to explore. Tours is a bustling town in the heart of the Loire valley with two roles - regional economic centre and attractive tourist destination. The centre of the town contains quite a good number of interesting buildings, squares and streets to explore and a visit is recommended when you are in the region. The town of Loches is situated in the Indre-et-Loire department, 50 kilometres to the south-east of Tours. It is an attractive and bustling town with several highlights in the interesting medieval centre and a highlight of a visit to the region. The Loire River originates in the Massif central, towards the south of France. It heads north as far as the important city of Orleans, after which it heads west towards the sea. Orleans is perhaps best known as one of the cities visited by Joan of Arc. Orleans is the capital of the 'Centre' region and is at the eastern end of the Loire Valley. Orleans city itself lost many buildings during the destructive World War II, but is now an attractive tourist and university centre. Bauge is north of Saumur in the Maine-et-Loire department of the Loire Valley (hence within the Pays-de-la-Loire region, not the Centre region of France). Although best known for the Chateau d'Amboise, the town of Amboise is also worth exploring. It is a beautiful small town running along the edge of the river and dominated by the beautiful chateau standing above the town. From the castle you get some excellent views over the town and river. Blois attracts many visitors because of the popular Chateau de Blois that is situated in the town, but Blois is also a very pretty town with plenty of historical sights to see and also a vibrant centre. It makes a very good base for visiting the castles of the Loire valley. Chinon is a picturesque Loire Valley town situated in the historical region of Anjou, with its castle spread widely across the hill behind a row of attractive house that front the river. Sitting high on a plateau, the huge Chateau de Chinon dominates the town. Cheverny is of course renowned for its castle, the Chateau de Cheverny. 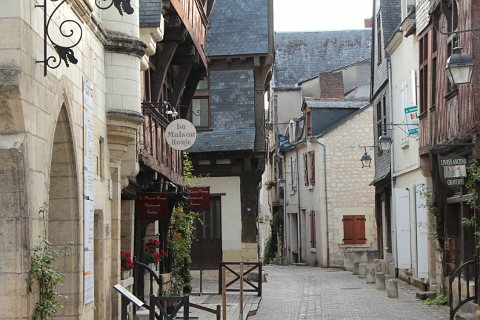 Cheverny is in the Loir et Cher department and is about a dozen kilometres south of Blois.